Flaunt a flawless look with ease and say hello to a more radiant-looking you. The formula glides on and layers beautifully, while three application techniques let you have the face you want each day. 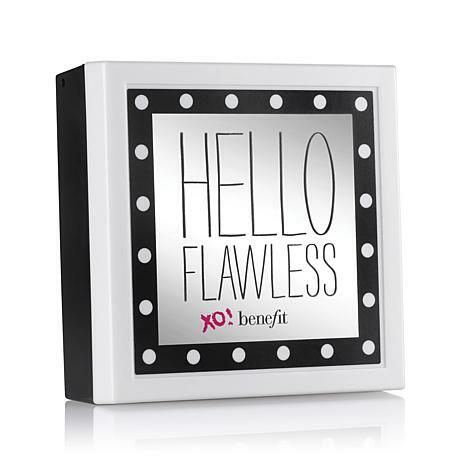 Fast, easy and fabulously flawless — it really gives you something to flaunt about. Ingredients: MICA, BORON NITRIDE, ETHYLHEXYL METHOXYCINNAMATE, SILICA, TITANIUM DIOXIDE, PHENYL TRIMETHICONE, NYLON-12, BENZOPHENONE-3, OCTYLDODECYL STEAROYL STEARATE, PENTYLENE GLYCOL, LAUROYL LYSINE, STEARIC ACID, ISOPROPYL TITANIUM TRIISOSTEARATE, SODIUM DEHYDROACETATE, TALC, ALUMINA, ALUMINUM HYDROXIDE, CAPRYLYL GLYCOL, SODIUM LAUROYL ASPARTATE, ZINC CHLORIDE, BHT. [+/-: CI 15850 (RED 6, RED 7, RED 7 LAKE), CI 15985 (YELLOW 6, YELLOW 6 LAKE), CI 19140 (YELLOW 5, YELLOW 5 LAKE), CI 42090 (BLUE 1 LAKE), CI 45410 (RED 27, RED 27 LAKE, RED 28 LAKE), CI 73360 (RED 30, RED 30 LAKE), CI 77007 (ULTRAMARINES), CI 77163 (BISMUTH OXYCHLORIDE), CI 77288 (CHROMIUM OXIDE GREENS), CI 77289 (CHROMIUM HYDROXIDE GREEN), CI 77491, CI 77492, CI 77499 (IRON OXIDES), CI 77510. 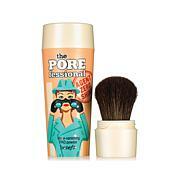 I have used this powder foundation for a number of years now & wouldn't be without it...ever! I have it on Auto-Ship in the color Petal but also purchase it in the Ivory & combine the two on my face because the Petal is a bit too on the yellow/orange side for my skin. My complexion looks awesome & people are totally astonished to find out I'm almost 72 (& look like I'm in my 50's)!! Thank you always to Benefit. 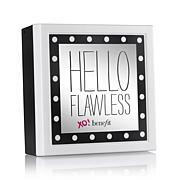 I've used Hello Flawless for a long, long time & love it. I ran out of this color (Petal) so I'm back on AutoShip. I also use the color Ivory & combine the two. Men & women alike can't believe I'm 71 as they think I'm in my 50's & have almost 'flawless' skin! I'm still hoping Benefit will make a color that is light but has pink undertones & not yellow undertones...that would be truly perfect for me & many others, I'm sure. But I highly recommend this product & wouldn't be without it ever! The item arrived in a well protected package. It is not full coverage but perfect for that no makeup look or on casual days. I really haven't been using much powder foundation but thought I'd try HF after studying the shade charts online. I really love this creamy texture which doesn't sit like heavy powder on the skin. I did order 2 shades when all Benefit was on easy pay/ flex pay or whatever HSN calls it. Both shades work well.. One a little better for summer, but still not too dark for now either. Just a light setting mist and it's a perfect solution to foundation in a hurry. I've used and enjoyed Pur Minerals in the past, but I think HF nailed it better on actual shades. Not too yellow as some have described, rather just a very slight yellow undertone- actually more neutral to my eye. This is good stuff at 1st impression at least. I know it'll save time in the morning. I do have dry skin but always use a base of various oils, let it sit for a few before applying. I recommend using this way for other dry skinned ladies. I have used this powder for about 6 years now. At age 76, it covers my skin perfectly and is sheer and does not look powdery or settle in the fine lines of my skin. I don't wear a foundation under it as the coverage is perfect. Highly recommend it to anyone who wants a no makeup look!